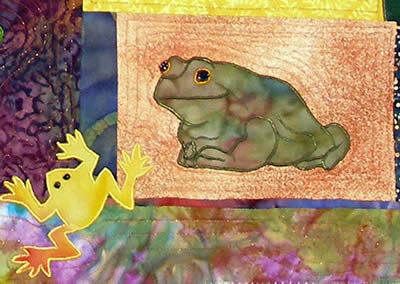 There are 12 frog appliques which you can arrange however you like. If your applique blocks don't fit together, just add a strip of fabric to the shorter block. That way two blocks become a unit. If units don't fit together, add another strip. I don't pre-plan my quilts. They just grow in this manner. Each frog has beaded eyes. The small frogs have only one bead for each eye. 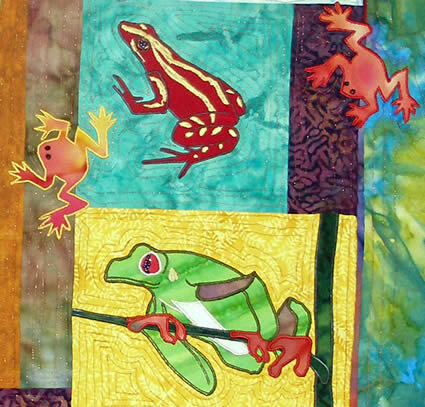 The larger frogs have groups of black iridescent beads surrounded by colored beads. 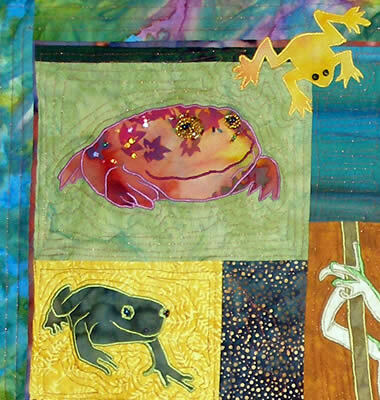 I added the five small froggies to help fill in the empty blocks and add more color to the quilt. The quilt in the photo measures 29" wide x 28" high. We have added color closeup photos to the PDF file pattern. When you order a PDF pattern, the download location will be sent within 24 hours of placing your order. Sorry, PDF format patterns are not available to wholesalers. They need to purchase the printed version. Some close up photos to show the details. 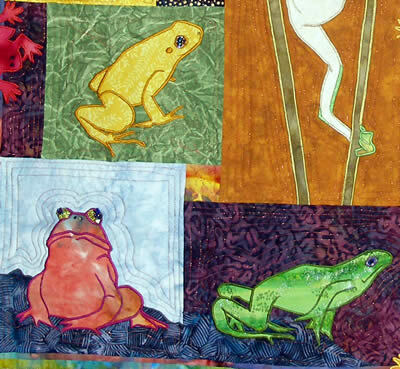 Several of these frogs have multi layers of fused fabric, but each one starts with a complete single color, so you have a base.